This easy cooked Moroccan salad is made by simmering zucchini (courgettes) with Moroccan spices, garlic, and herbs. Although delicious as a dip―it goes particularly well with Moroccan wheat bread―it can also be eaten with a fork or spoon. Serve warm or cold. Scrub the zucchini, but do not peel them. Cut off the ends, and chop the zucchini into tiny cubes. 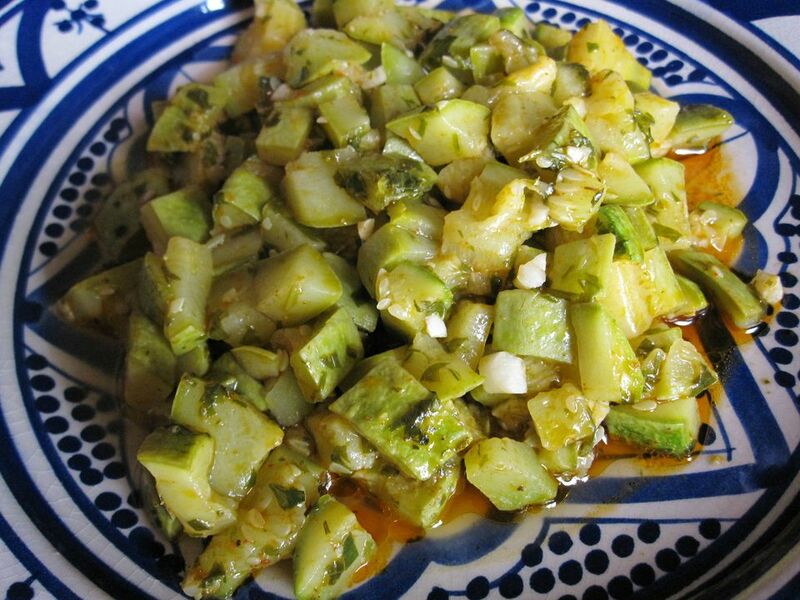 Place the cubed zucchini in a pot with the olive oil, garlic, spices, and water. Cover and cook over medium heat stirring occasionally, for about 7 to 8 minutes, or until the zucchini are crisp-tender. Add the lemon juice, parsley, and cumin and continue simmering, uncovered, until the liquids have reduced and the zucchini is tender but not mushy. Taste, and adjust the seasoning if desired. Serve warm or cold. Cooked zucchini salad can be eaten as a dip, or served with a fork or spoon.